Wow thats one nice tornado. Not sure what EF scale is? It looks like EF1 but destructive. Glad its in isolated area. Michael: I just been seeing alot of tornadoes has been reported in Australia more often now. Are we necessary to develop a tornado warning system? That is awesome and steady footage of a very nice tornado! Looks like it was heading into a rope out stage. Can we verify the date as 8th March 2011? Only lasted 5 or 10 minutes? I would say that is almost long lived by Australian standards! Some say it was 11Feb, but sources from work tell me it was 14thFeb, I did some hodograph simulations from the soundings from both days and the 11th was just rubbish...the 14th shear was speed orientated and not directional. Winds were from 24-37kts from Sfc to 700 with no directional shear. The plotted hodograph did not support supercell or meso set ups - which most here in Darwin swear to that it was a supercell. The hodograph just does not support it. It was linear and curved but pretty erratic akin to mutlicell storm structure with steering of no value. I would think it was a non-supercellular funnel given the speed shear, but lack of data for that day is a headache. I can't find a radar or doppler loop for the day which is frustrating, but given the Carlos factor I would not disprove some kind of vorticity as per the winds in that region. 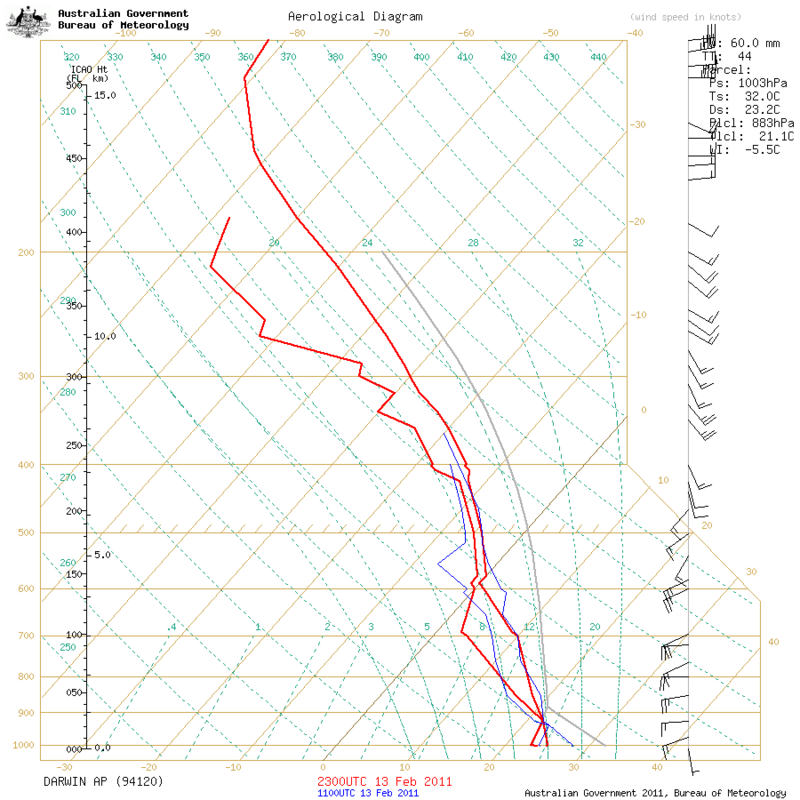 The sounding only gives Darwin's shear, which only gave it to 700hpa. The surface winds were around 24kts and up to 700 reached 37kts but non-directinal..they were all NW given the monsoonal flow dominating and the position of the developing cyclone over Darwin at the time. GFS indicated 30-40kt winds in certain areas of inland KaKadu during the model run. Either way it was impressive and even it was an EF0 the funnel was very cool! The tourists would have gone nuts over it. I'll try and hunt down some radar loops from BoM as they archive that stuff....might prove me wrong, but hodograph plot did not support supercell storms in that area. Well we certainly need to find out the date of it to put any analysis on it. Radar is available for the area - I'm guessing a little west of Jabiru or near Cooinda (as per radar locations)? Thanks, MB. Yep, Yellow Waters is in the West/South Alligator region, so you have to go through Jabiru and then backtrack slightly on another SW highway. Can't see too much on the radar...do you see anything supercellular in that mess in the Cooinda/Jabiru region yourself? I was told by the journo who did the story that it was the 14thFeb. Pity nobody kept a sat loop! PS...is anyone having trouble obtaining soundings from BSCH? Have not been able to get Darwin's skew-T for weeks? Yes have had issues for forecast soundings other areas too. Ok, given it was 14th Feb, the radar echoes which track from the NW towards Cooindah are significant given the distance from the radar, but can't tell if it's a supercell. Darwin morning sounding. The evening sounding stopped at the 750hpa level but does show 30-35 knots of WNW in the low levels: 950 to 800hpa which is quite strong. Australia is in the "South Pacific" region. Thanks guys. Yeah looked at the Wyoming site for the Skew but was as Michael mentioned...just to 700...so did not bother posting it as it only had winds to that level too which I saw were good. Hopefully more info will come from this but I doubt anyone - in fact could bet my house on it - that it went unnoticed except to the tour operator and his tourists!